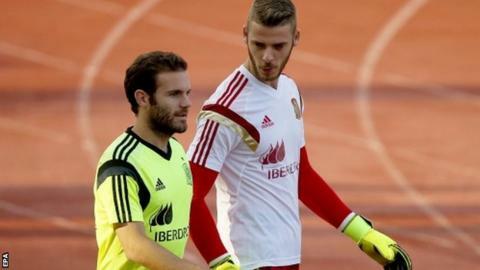 Manchester United have opened contract talks with goalkeeper David De Gea. The Spaniard's present deal expires in 2016 and United had previously indicated they had abandoned hope of the 24-year-old signing an extension. But following the collapse of a proposed move to Real Madrid on transfer deadline day, negotiations have begun, with De Gea's agent Jorge Mendes attending the club's training complex on Thursday. De Gea is yet to play this season. Manager Louis van Gaal refused to pick the former Atletico Madrid man until the end of the transfer window, such was the uncertainty surrounding his future. De Gea, United's player of the season for the past two years, was upset at Van Gaal's claim he did not want to play in the opening games of the season, although club sources have since indicated any damage to the pair's relationship will be easily repaired. It is still not known whether De Gea will start Saturday's Premier League game against Liverpool (17:30 BST).